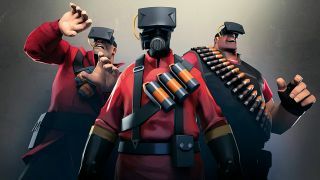 In the past, Valve has been ambiguous about its virtual reality involvement and hasn't done much publicly beyond giving awesome demos at its Steam Dev Days and releasing a SteamVR Oculus Rift-connected beta earlier this year. But now, you can now officially add Valve as one of the latest players in virtual reality. SteamVR will have hardware to go along with the software. The new hardware - which will probably be a head mounted display - is debuting during GDC 2015, and it sounds like it will be on level with the Rift or Project Morpheus opposed to a prototype like the Razer OSVR. VR publishers and developers have been encouraged by Valve to sign up here for hands on time with the SteamVR dev kit. Don't think that Valve's forgotten about the Steam Machines. They'll still be a huge part of GDC. It's likely we'll see the Alienware Alpha and its buddies make an appearance alongside the unveiling of the newest, "refined" Steam Controller. Interestingly, "new living room devices" will be shown off as well in addition to the aforementioned Steam Boxes. What are the other virtual reality devices out there?